Israel and Singapore, on the surface, share many characteristics when it comes to security and defence. Both are small countries with relatively small populations and no strategic depth, ostensibly surrounded by a metaphorical sea of adversaries or potentially hostile neighbours. Both rely heavily upon sizable conscript armies, drawn from (more or less) universal national service and long reservist obligations. Both have military expenditures that are relatively high for countries their size, and their armed forces — air, sea, ground, and other — are generally equipped with the most advanced weaponry that is readily available (and kept in a high state of readiness). Moreover, both Israel and Singapore place a great deal of importance on advanced military technologies for national defence. In both countries, technology is viewed to be a critical force multiplier when it comes to national security and defence, and the idea of leveraging advanced militarytechnological capabilities as much as possible is an inarguable one. In conjunction with this approach, achieving a high degree of self-sufficiency in sophisticated armaments has long been a priority for both countries. As such, both countries have, by design, created and nurtured a clutch of indigenous defence industries, with the intention of meeting — as much as it is financially and technological feasible — national requirements for the acquisition of advanced weapons systems and other types of military equipment. 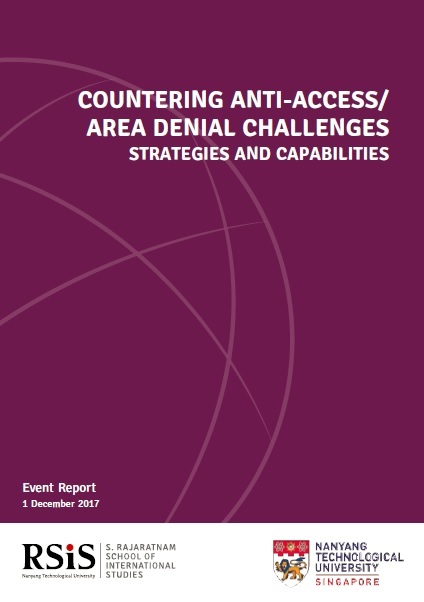 Increasingly, both countries face a growing security challenge from antiaccess/ area denial (A2/AD) strategies being undertaken by regional rivals or competitors. These emerging A2/AD strategies threaten to undermine Singaporean and Israeli defence capabilities, and therefore their ability to deter or defend against threats to their territories. To address the issue and challenges of A2/AD, the Military Transformations Programme within the Institute of Defence and Studies at RSIS, in cooperation with the Haifa Research Centre for Maritime Policy & Strategy, held a one-day workshop on 1 December 2017 in Singapore on “Countering Anti-Access/Area Denial Challenges: Strategies and Capabilities.” The workshop brought together specialists in A2/AD and maritime security to discuss present and future potential challenges of A2/AD strategies, and how these might affect maritime security in regions near to both Singapore and Israel (e.g., in the South China Sea, and the East Mediterranean Sea and the Red Sea). Three representatives from the Haifa Research Centre for Maritime Policy and Strategy (HMS) attended, and the workshop was also attended by several officers from the Ministry of Defence, Singapore (MINDEF), and the Republic of Singapore Navy. Issues addressed at this workshop included: (i) broad conceptual definitions and implications of A2/AD; (ii) current and future potential technologies and capabilities for A2/AD; (iii) the impact of such technologies on regional maritime security doctrines and defence strategies for both Singapore and Israel (e.g., in the South China Sea, or in the East Mediterranean and Red Sea); and (iv) the ways in which Singapore and Israel might leverage A2/AD strategies and capabilities for their own benefit.